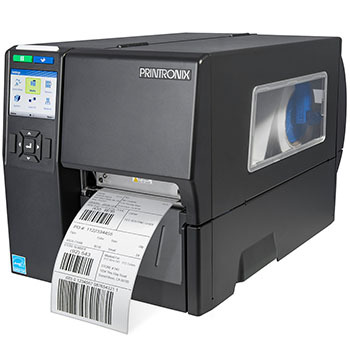 Printronix Auto ID, a global leader in the AIDC barcode printer industry, has announced the addition of the T4000 Compact Thermal Barcode Printer to its impressive line of high-performance industrial printers. The compact size of the T4000 allows it to fit in environments where space is limited but enterprise level performance is still required. Despite its small stature, the T4000 can easily print up to 5,000 labels at day at an impressive eight inches per second and comes with a wide array of versatile features. Designed with today’s high-tech requirements in mind, the T4000 fits seamlessly into any environment with multiple connectivity options, remote printer management tools and automated alerts that keep operations functioning at optimum efficiency and productivity. The T4000 comes standard with Ethernet, USB host, USB device and Serial connectivity. State-ofthe-art versions of Wifi and Bluetooth can also be ordered as optional features.